November 3 through May 18. Storytimes at the North Olympic Library System (NOLS) feature stories, fingerplays, music, and plenty of movement and fun. Studies show that children who are read to before the age of five develop essential pre-reading skills, supporting later success in school. 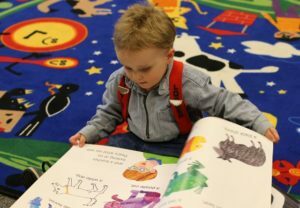 Activities such as talking, reading, playing, and singing all play an important role in early childhood development, which is why they are included in Family Storytime. These activities support skill development and encourage children to interact with their caregivers and peers in a fun, literacy-rich environment. After each session, parents and caregivers will have an opportunity to visit and swap information about parenting resources in the community.